Recipe by Gabriel Li of Lunchroom Toronto. 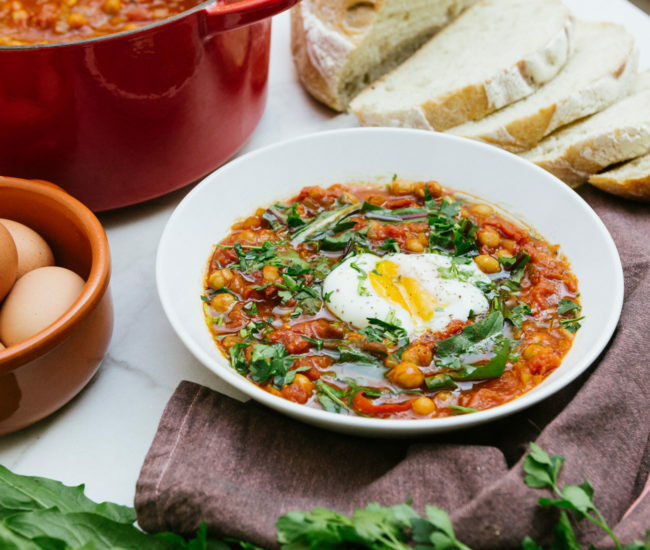 This simple vegetarian stew is perfect to share with your loved ones, or studio co-workers on a cold winter day. Having canned goods on hand in your pantry keeps it convenient. Feel free to interchange the greens and herbs: for example you could easily use kale or collards in place of the dandelion, and dill or cilantro in place of the parsley if that is what you have in the fridge. I like to buy fresh sour dough at my local bakery but any crusty bread loaf will do. And if you want to get fancy, you can sous vide your eggs for the creamiest textured onsen eggs. Feel free to use kale or collards in place of the dandelion, says Li. 1. In a medium pot, over medium heat, sauteé garlic and onions in oil with a wooden spoon until translucent. Add in cayenne, paprika, curry, sea salt and continue sauteé for 3 mins. 2. Hand crush whole tomatoes into the pot, stir and then add in chickpeas. Cover and continue to simmer over medium heat for 20 mins. 3. Meanwhile in another pot with boiling water, add in vinegar, stir and gently poach eggs separately until whites are cooked and yolk remains runny. 4. 5 minutes before serving, stir in dandelion and a handful of parsley. Toast sourdough slices if you desire. 5. 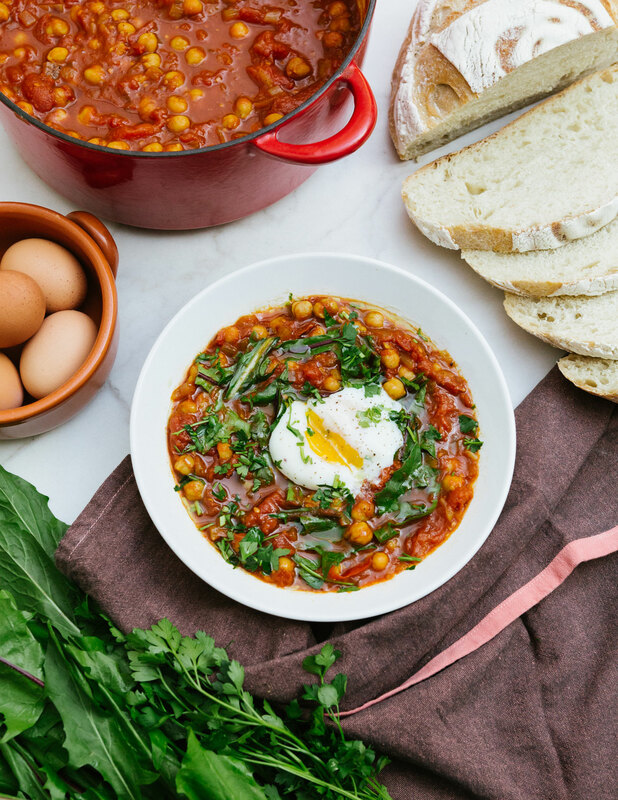 Serve stew in individual bowls, place poached egg on top, another sprinkle of fresh parsley, and drizzle your favourite olive oil over the dish and sourdough. 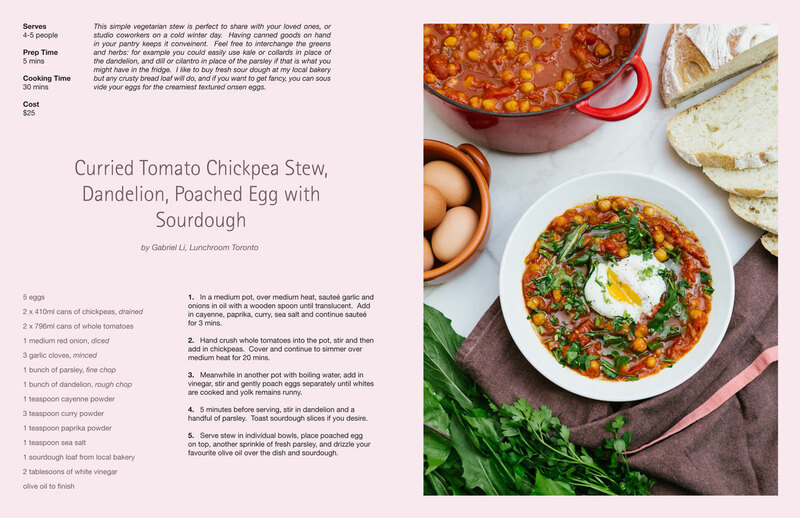 Click on the image below to download recipe card.